When do I send my rehearsal dinner invitations? Rehearsal dinner invitations should be sent 2-3 weeks before the rehearsal dinner. 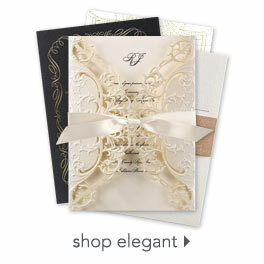 Many couples choose to send their rehearsal invitations at the same as their wedding invitations. Who receives a rehearsal dinner invitation? Do not assume people in your bridal party or immediate family know they’re invited to the rehearsal dinner. Send an invitation to everyone. Here’s a typical guest list…read more. How many rehearsal dinner invitations should I order? Order one invitation per single guest and one invitation per couple. Order one invitation per family and let parents know by word of mouth whether children are invited or not. Remember to order a few extra invitations just in case they’re needed. Your big day is almost here! Celebrate with your closest family and friends and invite them in style with the perfect rehearsal dinner invitations. Sill looking for the perfect accessories for your wedding? Discover our ceremony accessories and reception accessories and find the perfect pieces to add to your décor!